Sunday Swim Lessons and More at SHS Pool Starting Soon! Adult Masters Swim Workout- A coached swim workout for beginner adults to advanced levels. Get ready for the triathlon on your bucket list! Adult Water Aerobics- Welcome back to the pool! Get your cardio up with some rockin tunes! Lifeguard Re-certification Class- Perfect timing right before summer! This is for lifeguards who need to renew their certification. There are four sessions scheduled. To register for classes simply go on the website www.aquasafecapecod.com and look at the schedule. Email Trish with your preference aquasafe@comcast.net. It means so much to us all to have Trish Cundiff bringing public swimming back to the Sandwich Community Pool. We asked her to share some of her thoughts about what the pool means to her…. The Sandwich Community Pool has always been a huge part of my family’s life in Sandwich. We moved here over 18 years ago. The main reason we chose to live in Sandwich was because they had a community pool. A community pool was something my husband and I had growing up. We wanted our kids to be lifelong swimmers as we both are. My husband and I both swam in the Sandwich Masters Group. My boys, Tom and Brian, took swim lessons at Sandwich High School and swam on the Wahoos Swim Team. They became captains of the Sandwich High School Swim Team. They were proud to be a part of some undefeated seasons with the Blue Knights. Tom and Brian became certified lifeguards and spent their summers lifeguarding in Barnstable and Nauset. It is such an integral part of Brian’s life that he chose to join the US Coast Guard with the goal of becoming a rescue swimmer. I am sharing these details not to be boastful but to paint the picture of how central the community pool has been to our family as members of the town of Sandwich. We were all heartbroken when the pool was closed to the public. We were great friends with all of the swimmers and water aerobics people. We knew how vital the pool programs were to their health and well being. It was a further heartbreak when the pool was closed down due to maintenance issues. We worked hard to ensure the money was found to repair the pool. Now that the repairs have been completed I am overjoyed to see the Sandwich High School Swim and Dive Teams back in their home pool. I am thrilled to see the high school pool being used by the students during the school day. They are able to take swimming as part of their gym classes and they have the opportunity to take lifeguarding classes during the school day. After attending a school committee meeting about building a rear entrance for community access, I emailed the school committee to applaud them for their creative ideas and problem solving attitude. Discussion turned to finding a person to run a program on Sundays only since there were no students in the building at that time. When the RFP was put out by the town I was happy to apply for it. 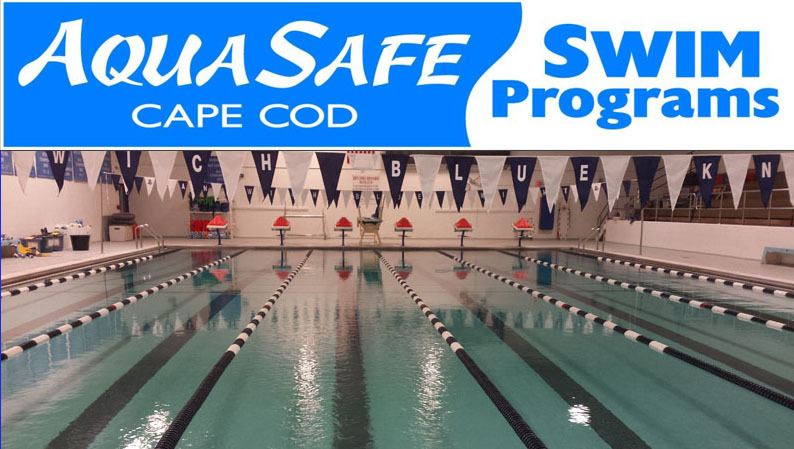 I have owned and operated AquaSafe Swim Programs successfully in Falmouth for 10 years now. I am a resident of Sandwich with a very strong love and attachment to the community pool here. I am determined to see the families of Sandwich benefit from the Sandwich Community Pool the way my family has. I am excited for what the future will bring. There are kids who will be exposed to swimming at a young age. The more convenient it is for the kids in Sandwich to get to lessons–the more kids will learn to swim. This will literally save lives. Some of these kids may not participate in other sports but they will find a love for swimming. There are kids who will go on to become lifeguards and have a great summer job and save lives in the process. It is an opportunity for our kids to get out from in front of a screen and move! The senior members of our community thrived on the water exercise program in Sandwich. I want to see that program returned to them. I know of so many in our community who rely on the water as their only form of exercise due to physical ailments and limitations. I cannot wait to see them enjoy the benefits of our community pool again. I want everyone that comes through those doors to be a swimmer for life. SWIM LIKE A FISH…TALK TO TRISH!